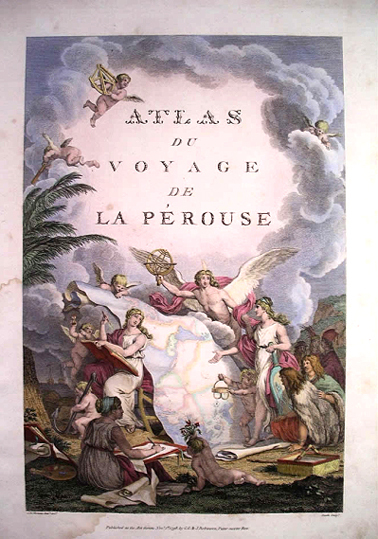 Atlas du Voyage de Lapérouse. 1785 -1788. A hand coloured atlas struck from the copper plates of the 1797 Atlas of the Journal of the 1785 – 1988 Lapérouse expedition. The French Musée de la Marine presented the prints to the Lapérouse Museum in 2003. The copper plates were etched in 1796 – 1797 from sketches sent to France by the offices and crew of the Lapérouse expedition and are now held in the collection of the Musée de la Marine, Paris. The plates were discovered in the late 1980s and were conserved shortly after. The plates were found to be in excellent condition and were able to strike prints again. 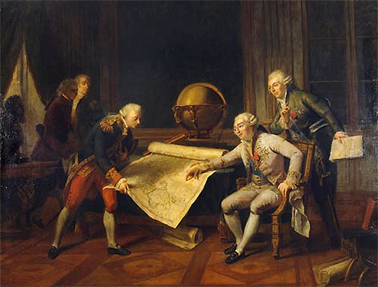 The Musée de la Marine felt that the Lapérouse Museum at Botany Bay should have a complete set of prints for its collection as it is a significant place to the history of French navigation. The prints are hand coloured with fine details that feature the views and maps of the places the expedition visited between 1785 and 1788. These include Alaska, California, Hawaii, Korea, Japan, Russia, Tahiti, Samoa and finally the east coast of Australia. They also feature the exotic plants and animals they observed such as the chilli, passion fruit and the Pacific marine stinger. Dimensions: Approximately 700mm long x 500mm wide x 140mm deep. French interest in the Pacific stemmed from the curiosity of Enlightenment scientists and navigators in the thousands of unknown islands and the mysterious Great South Land. These places were thought to be inhabited by strange plants, animals and populated by people who were different to any other nation of the time. During the 1600s the new frontier was extending to the south. All of the major European countries were players in the exploration of the Southern Hemisphere. The existence of Terra Australis or ‘Land of the South’ was mooted by various navigators and little by little evidence of its existence was mounting. Slowly contact was made, first by the Spanish led by Luis de Torres in the north, who sailed through the straits between New Guinea and Cape York in 1606. The Dutch came next with Janzoon (1606) in the west and Abel Tasman (1642) in the south at Van Diemans land. The Dutch mapped parts of the continent naming it New Holland, but showed no further interest. The navigator to search for coast of Terra Australis was France’s Louis Antoine de Bougainville who in 1768 approached the Great Barrier Reef off the coast of North Queensland but was turned away by the surf. England’s James Cook expedition to the south Pacific finally established that there was a land of the South. After completing the observation of the transit of Venus across the Sun at Tahiti in 1769, Cook set off to explore the south Pacific. After exploring New Zealand and establishing that it was two islands and not the Land of the South, Cook sailed further west. In April 1770 Cook sailed onto the east coast of Australia. In a simple ceremony at Botany Bay, Cook named the coastline New South Wales. 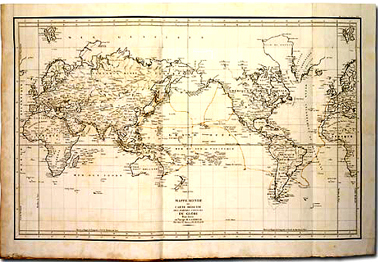 Cook extensively mapped the Pacific during three expeditions between 1768 and 1779. Single handedly Cook opened up the Pacific revealing a lot of its secrets. After extensively mapping and recording the coastlines of North America, Japan, Korea and Siberia, Lapérouse was directed by the French government to go to Botany Bay to observe the founding of the British Colony by the First Fleet. On 26 January 1788 Lapérouse arrived at Botany Bay, just as the British were leaving for Port Jackson. The commander of the Fleet, Captain Phillip, ordered that two British naval vessels, Sirius and Supply, meet the French. Contrary to popular belief, the French did not have orders to claim Australia for France. ‘We spent the whole of the 24th (Jan 1788) plying in sight of Botany Bay, but that day we had a spectacle; this was the British Squadron at anchor with their pennants and ensigns which we could plainly distinguish’. La Pérouse Journal, 1788. The French stayed at Botany Bay for six weeks and built a stockade, observatory and a garden for fresh produce on the La Perouse peninsula. There had been a skirmish with natives in Samoa in which 12 of the crew were killed, including Langle, commander of L’Astrolabe. Father Reçeveur, expedition naturalist and chaplain, was injured in the skirmish and died at Botany Bay. He was buried at Frenchmans Cove below the headland that is now La Perouse. The place was marked by a tin plate which the Aborigines promptly removed. The British replaced it with another and tended the site. Reçeveur was the second European to be buried in Australian soil, the first was Sutherland from Cook’s 1770 expedition who as buried at Kurnell. The last official sighting of the French expedition was in March 1788 when British lookouts stationed at the South Head of Port Jackson saw the expedition sail from Botany Bay. The expedition was wrecked on the reefs of Vanikoro in the Solomon Islands during a cyclone sometime during April or May 1788. The fate of the expedition was to remain a mystery for nearly 40 years. The Atlas du Voyage de Lapérouse has historical Significance as evidence of France’s push into the Pacific and keen interesting the settlement of Botany Bay. The collection is significant as evidence of the place where the First Fleet landed and the subsequent meeting of the British, French and aboriginal people. The collection also has historical significance as France’s 1988 bicentennial gift to Australia. The Atlas du Voyage de Lapérouse has aesthetic significance as an excellent example of French eighteenth century map making and botanical and ethnographic etching and an print making. The collection is significant for researchers as it is one of more extensive collections of the Lapérouse expedition and one of the few existing European collections surviving related to early colonial Botany Bay and French exploration. The collection is well provenanced to Lapérouse Museum and the Musée de la Marine, Paris France. The collection is extremely rare. There are only a hand coloured few copies from this striking in existence. The collection represents a time when France was beginning its push into the Pacific to rival the influence of Britain. The collection also reflects the precarious nature of sea journeys, navigation and shipping in the late 18th century. The collection also obliquely represents the triumph of European claim to Aboriginal land and Aboriginal displacement. The collection is in excellent condition for its age and material. The Atlas interprets the story of the Pacific exploration, the La Pérouse expedition and their meeting with the First Fleet at Botany Bay in 1788 and the development of 19th century Australian colonial values and consciousness to the world. The collection interprets the reverence the La Perouse site has had for France since 1788. Coupe, S. & Andrews, M.
The Journal of Jean- Francois de Galaup de La Perouse. 1785 -1788.